Counting the Days Until Spring (62!) --Garden Bloggers' Bloom Day. Only 62 more days of dank, gray, depressing nastiness. I know I shouldn't complain. After all, we sweated on Sunday, with the temperatures hitting mid-70s. And I know you northern friends are rolling your eyes at me. I remember those lovely days of -50 degree wind chill and salt-stained boots. If we'd just have a little burst of sunshine, I wouldn't complain. I promise. The grayness and the rain are just making me feel...moldy. Lethargic. Sluggish. Still, I know spring lurks just out of reach. The first snowdrop! Isn't it the most cheerful little bloom? I adore its lack of pretension. I especially love how easily you can miss the secret little green heart hidden within. Do you see it? Closely followed by the first snowdrop, the hellebores began their lovely display. Thank goodness for hellebores. In the midst of the oppressive grayness of January, when everything is bare, dank, muddy, and stagnant, hellebores quietly unfurl, providing the pop of color and bit of hope winter gardeners crave. Particularly in our shady gardens, hellebores provide lovely color, as well as year round interest with their evergreen, serrated foliage in zone 7b. I've also seen hellebores used in many of the trendiest floral studios, like Saipua. If you need a dose of sheer, awe-inspiring beauty, check out Saipua, as well as Floret Flowers. These women produce amazing work. I need a flower farm. Sigh. As I tried to get a better angle for the hellebore photos, Oreo decided she needed some love. My love affair with fraise des bois continues. Mid-January, and look--blooms. We'd still be eating berries if we hadn't experienced two weeks of freezing evening temperatures earlier this month. 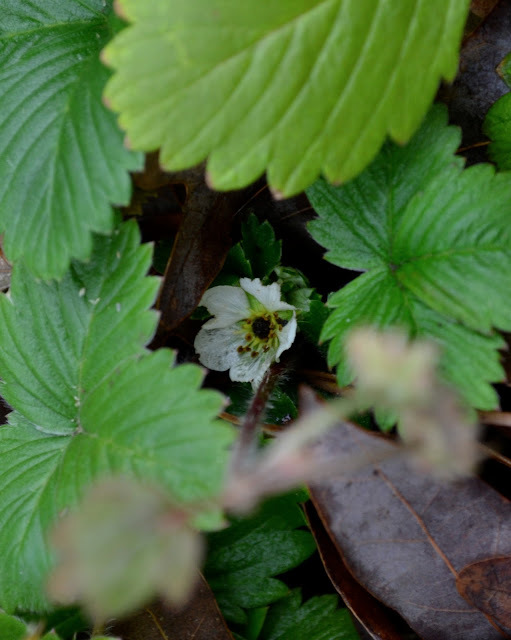 Everyone needs fraise des bois in their gardens. Yes, you do--trust me. 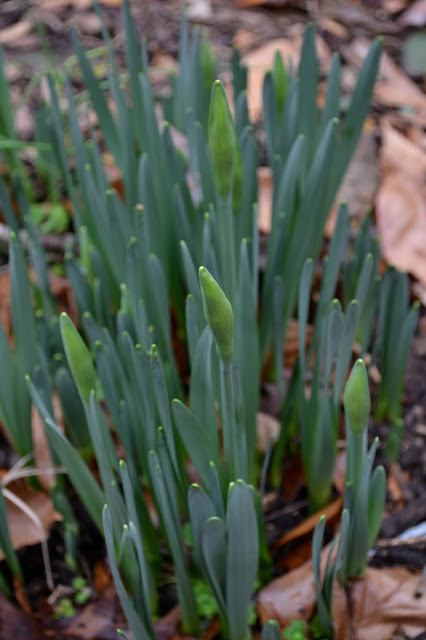 The daffodils are ready to pop. Is there anything more cheerful than daffodils? My mom used to buy a 10-stem bunch of daffodils from the grocery store for $1.99, just to brighten the kitchen table. When I began working, I always kept a vase of daffodils on my desk during the sad Chicago winter. Daffodils make me happy. 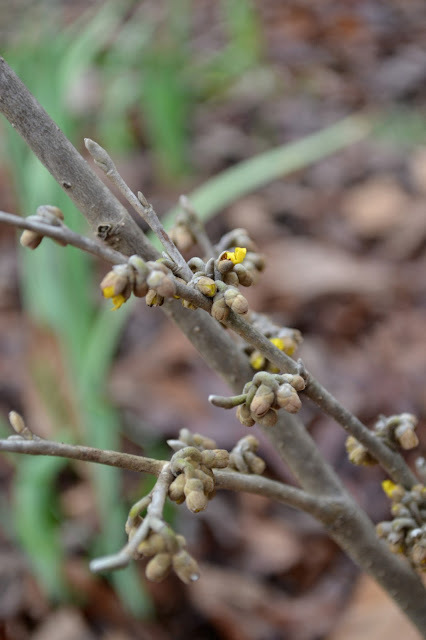 New to the garden last fall, the witchhazel buds are about to burst. I'm excited to see how it performs, plus I can't wait for its fragrance to grace the garden. One of my favorite fragrant bushes is winter daphne. We're often warned that daphne is temperamental when planted in garden beds, so I chose to plant ours in containers near the front entrance. I'm anxiously awaiting its sweet, welcoming greeting. It's so close, I thought for certain it would be blooming in time for GBBD. Patience. Not my strong suit. Kristen's cherry tree continues to bloom...and bloom...and bloom. A few flowers here, a few there. It's been non-stop since autumn, but just piddly little blooms. I envisioned a cherry tree overwrought with blossoms. Lesson learned. This photo is a good example of how dreary the days are--nothing but gray. I'm excited about a few new blooms added to the garden. Somehow, I never planted hardy cyclamen in our shady garden. What was I thinking? I definitely needed to rectify that mistake. Not only do the blooms add a nice pop of winter color, but the foliage is showstopping. 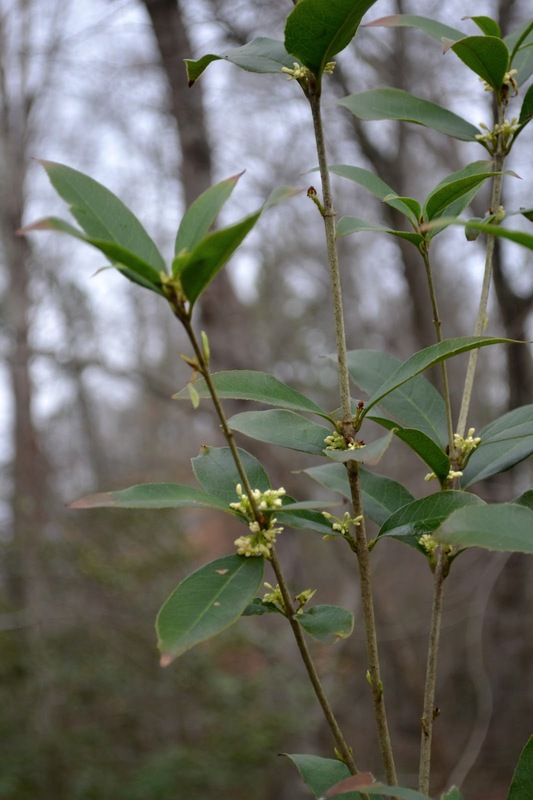 The tea olives continue to do their duty, offering a bit of fragrance from their diminutive blooms. While I scouted for blooms along the pool, Sugar came looking for a treat. Poor girls, their run is a muddy mess after today's rain. Our edibles continue to produce well. I thought the mushroom logs would be dormant for a bit, but we're still harvesting mushrooms regularly. I need to bump up my mushroom recipe repeteriore. Ah, camellias...they never disappoint. While they've already put on their big show, a few encores remain. On New Year's Eve Day, our family visited a local nursery, where we all received coupons toward plants and merchandise. Mikey selected a camellia, which he insists must be planted right outside his window. I'm negotiating. If I plant it right outside his bedroom window, it will be in the middle of boxwoods and azaleas. Of course, our gloomy days always get a reprieve with pansies and violas. 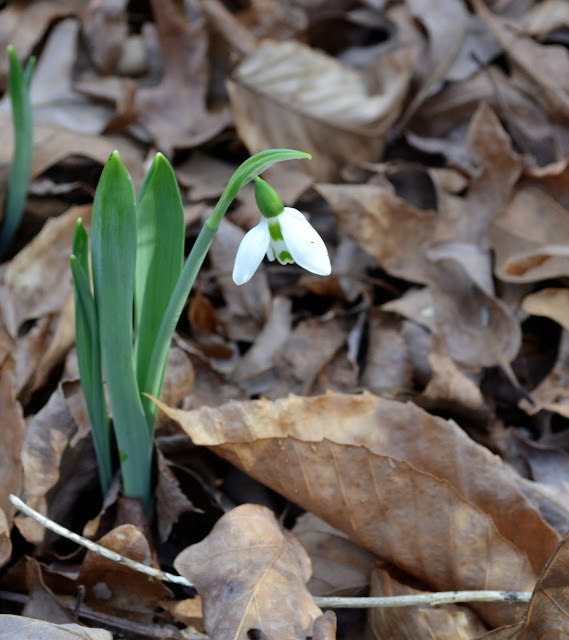 Their cheerful little faces brighten January days. I've loved pansies since I was a child, except that we planted them in the spring when we lived in Indiana. Our typically cheerful blooms looked tired today, drooping under the weight of rain. The violas, though, still provide a burst of perkiness. As I've mentioned a time or two, I'm a hopeless failure with house plants. However, I'm determined to keep alive the two lovely orchids I received for Christmas from my family. I do manage to keep forced bulbs healthy throughout the holidays, at least. 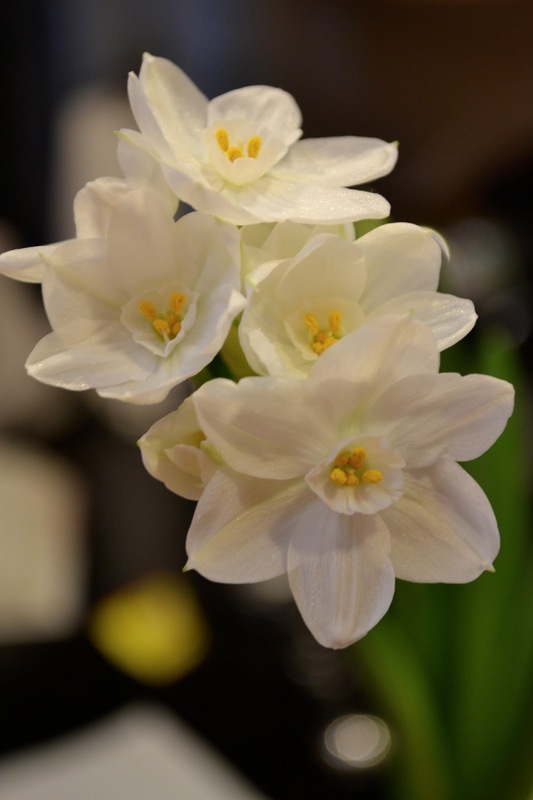 Paperwhites are so simple to force, and the variety I purchased had a nice, subtle fragrance--not the typical sickeningly sweet scent. And finally, finally...my amaryllis bulbs began blooming--yesterday! Just in time to share for Garden Bloggers' Bloom Day. So, only 62 more days until our gardens will be filled with blooms. Until then, I'll be heading over to May Dreams Gardens to see what my garden blogger friends found blooming in their gardens. Do you have any blooms to share?